121.5 MHz distress beacons are no longer detected. You must carry a digital 406 MHz distress beacon. The Australian Maritime Safety Authority (AMSA) recommends beacons with Global Positioning System (GPS). The information below is written for an Australian-based audience. See using your beacon for information on beacon activation overseas, noting that some countries consider Personal Locator Beacon (PLB) carriage and activation illegal on land. If you're not sure which beacon to use, see our guide on choosing the right beacon. PLBs are smaller and easier to transport than other beacons, and are designed to be worn or carried by individuals rather than vehicles. In some cases, PLBs do not meet carriage requirements for maritime vessels travelling more than 2 nautical miles from the coast. PLBs may be carried in place of an ELT. Refer to CASA for further details. In most states, EPIRBs are required for boats that travel more than 2 nautical miles from the coast. EPIRBs may also be used on land or carried in place of an ELT. Go to our page on float-free EPIRBs for more information. ELTs are designed to be fitted to aircraft. In some cases, EPIRBs or PLBs may be carried in place of an ELT. Refer to CASA for further details. *Hours of operation refers to the minimum amount of time that your beacon will continuously transmit a signal after it has been activated. 121.5 MHz distress beacons are no longer detected by satellite and are no longer licensed for use. Replace your old 121.5 MHz beacon to a GPS 406 MHz distress beacon as soon as possible. Don’t forget to dispose of your old beacon correctly and register your replacement beacon. 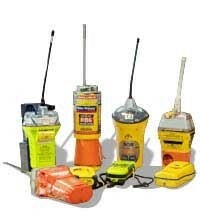 This list is provided as a courtesy, showing Emergency Position Indicating Radio Beacon (EPIRB) distress beacon models that, if purchased in Australia, are known to meet Australian Standards AS/NZS 4280.1 and AS/NZS 4280.2. These standards are maintained by Standards Australia. To find out more about any beacon model, see the manufacturer's website. To find out about Float-free EPIRBs, see our float-free EPIRB page. There may be additional beacons that meet standards that do not yet appear on this page. AMSA does not endorse any particular brand or model of distress beacon. This list is provided as a courtesy, showing Personal Locator Beacon (PLB) distress beacon models that, if purchased in Australia, are known to meet Australian Standards AS/NZS 4280.1 and AS/NZS 4280.2. These standards are maintained by Standards Australia. To find out more about any beacon model, see the manufacturer's website. Note: PLBs are not considered a substitute for EPIRBs when adhering to State and Territory marine carriage regulations.